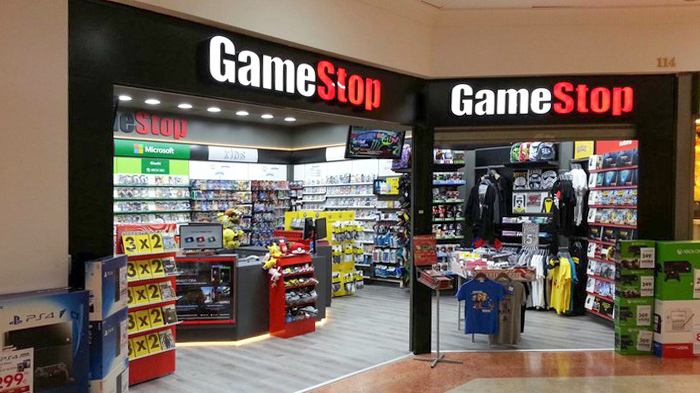 Today, GameStop, the largest independent seller of video games in the USA, announced that they will no longer try to find a new buyer. The company had started looking for potential buyers back in June 2018, a search that ended today “due to the lack of available financing on terms that would be commercially acceptable to a prospective acquiror”, according to GameStop. In other words: not one of the potential buyers considered GameStop a good investment or having a viable business model. Why exactly is GameStop in trouble? Click through for an explanation! 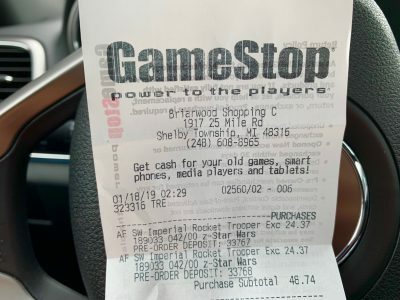 JTA reader Aldo S. informs us that the The Black Series Rocket Trooper is up for in-store pre-order at Gamestop! So you may want to head to your local Gamestop and see if you can pre-order him too! Below is visual confirmation of Aldo’s pre-order! Thanks Aldo, for the alert! If your Amazon order was canceled, keep an eye out for the 6″ Dengar showing up at retail. JTA reader Jediscar found him at his local GameStop in Seabrook, NH. He also picked up the latest 5 POA wave at Walmart. Much to my dismay, I found a lone 6” Dengar at Gamestop in Seabrook, NH. This just 2 days after Amazon canceled my order. Then I went next door to Walmart and found the new 5poa wave – Rio, Val, Beckett, Han (mud trooper), L3, ERG, Tulsite). Thanks for your great site! JTA reader CadeSky reports in from New Hampshire that he found the latest TBS 6″ wave at his local GameStop for $19.99. Thanks for the alert Chris! Let us know in the comments if your local GameStop has anything worthy. 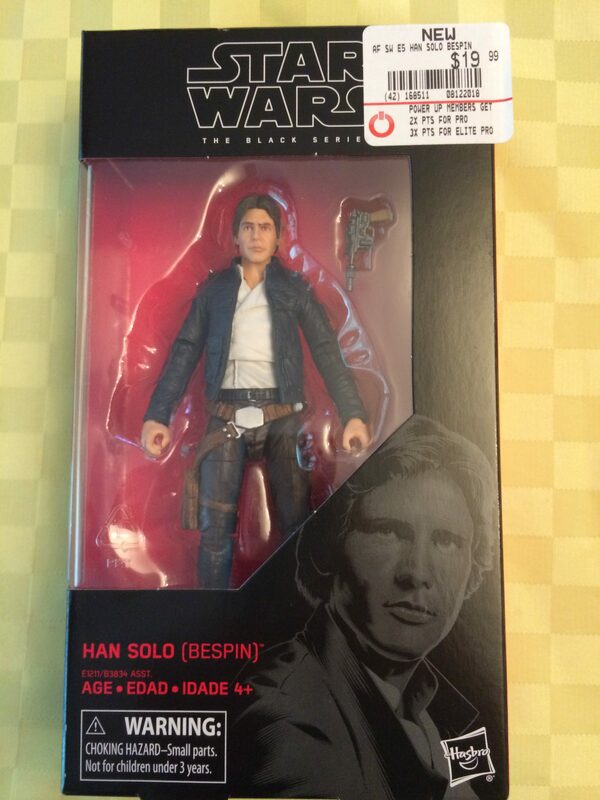 Hi JTA crew, just wanted to let you know that I found the Bespin Han at two different GameStops in NH today. I was really surprised to find this figure. Curiously, there was no sign of the Rebel Trooper at either location, and an employee couldn’t find it in the system. Now the thing I was really happy about was that they were selling Han for MSRP (usually GameStop’s price on TBS figures is $22.99). Just wanted to get the word out so that people can check their local GameStops too. JTA Facebook reader Craig G has found the Rey Centerpiece figure at his local GameStop. If you recall, JTA broke the news in October of 2017 that the Centerpiece line would continue with Rey and Kylo Ren. The line hasn’t performed as expected and Hasbro will be “retiring” it now. Commander Wolffe Arriving To GameStop And From Online Orders! The store reports and delivery reports are pouring in that the GameStop exclusive Clone Commander Wolffe 6″ figure is arriving! If you haven’t seen this figure up close yet, check our our RDR on it HERE! Clone Commander Wolffe is currently IN STOCK at GameStop.com too if you’re interested! Special thanks to JTA reader cress for this report! ← July Is "Some Like It Hoth" Month In Our Vintage Kenner Reviews! Pre-order TBS6 [P3] Clone Commander Wolffe At GameStop! Pre-order the GameStop exclusive The Black Series [Phase III] CLone Commander Wolffe 6″ figure for a July 17, 2018 ship date! You can also check out our review on this figure HERE! Thankt o all who wrote in to let us know about this pre-order! What's The Deal With The 6" 4-LOM? 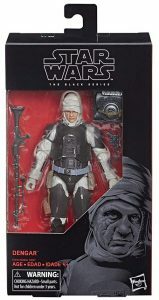 Why is everyone in the world finding The Black Series [Phase III] 6″ 4-LOM except for me!? Congratulations go to JTA reader Henry M. who found this wonderful selection of 6″ figures at his local GameStop store. We have also been getting reports of this figure hitting TARGET with regularity too. Oh, and shipping notices are going out from Hasbro Toy Shop that this item arrived two-weeks earlier than expected! Nice! Good luck if you still need this bounty hunter too. If I had known that 4-LOM would be the most challenging figure of 2018 to acquire, I would have gotten him early from my source in Asia. Sigh. GameStop Online Only The Black Series [Phase III] Discounts! 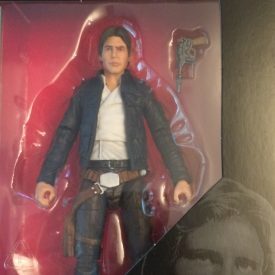 There are quite a few The Black Series [Phase III] 6″ items generously discounted at GameStop, some of which are brand new Solo: A Star Wars Story product launch items. Many of these discounts are online only. Check them out! Special thanks to JTA reader Kevin H. for the notification! Good Deals At GameStop For Hasbro Star Wars Figures! GameStop is running a decent sale for 25% off select Star Wars merchandise. The Black Series [Phase III] 6″ figures are ubcluded. Special thanks to JTA reader Micke W. for writing in to let us know! Jaina Solo (Legends) IN STOCK At GameStop! If you still need her, Jaina Solo (Legends) is IN STOCK at GameStop.com. Special thanks to JTA reader Agustin for the alert! 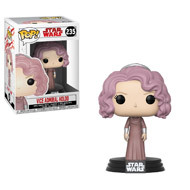 You can pre-order the Vice Admiral Holdo Funko Pop! right now at Gamestop.com with a December 15th release date. Strange thing is it is priced at $24.99, which is usually the price for Deluxe Pop! figures. What’s the deal? I have no idea! Thanks to JTA reader and friend Charlie for the heads up! 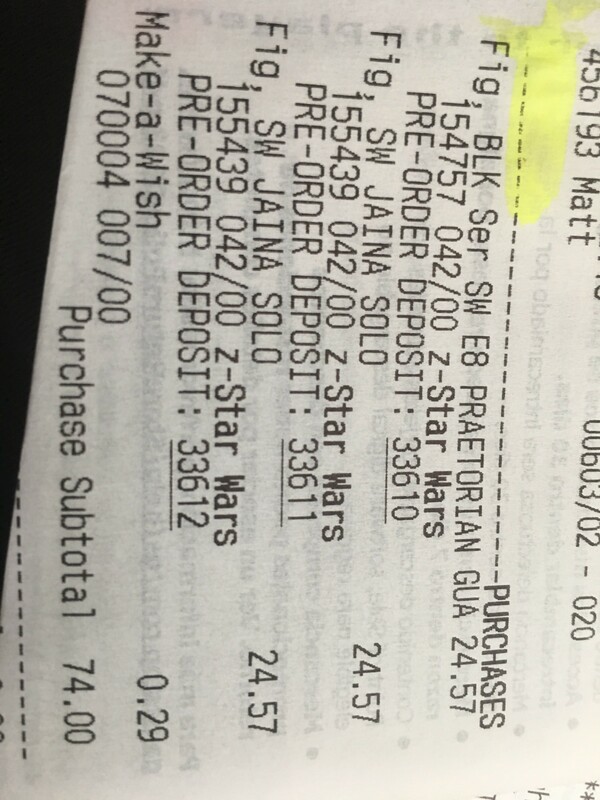 In other Pop news, there is a new Walmart Exclusive Luke in Xwing on the way! I Love those ship Pops! Here is the Walmart SKU: 828856278 for those interested in keeping track. ← Lukey Here: Different Versions Of "Ahch-To Island" Luke Being Found! If you’re fortunate to have a GameStop store near you with stock, the Rapid Fire Imperial AT-ACT vehicle is only $49.99. Click HERE to see if there is a store near you with availability! JTA Reader Alexander F. sends us in this report of his latest purchase from Gamestop.com. He originally ordered two Artoo-Detoo 40th Anniversary Black Series figures, but when they showed up, he got a big surprise. 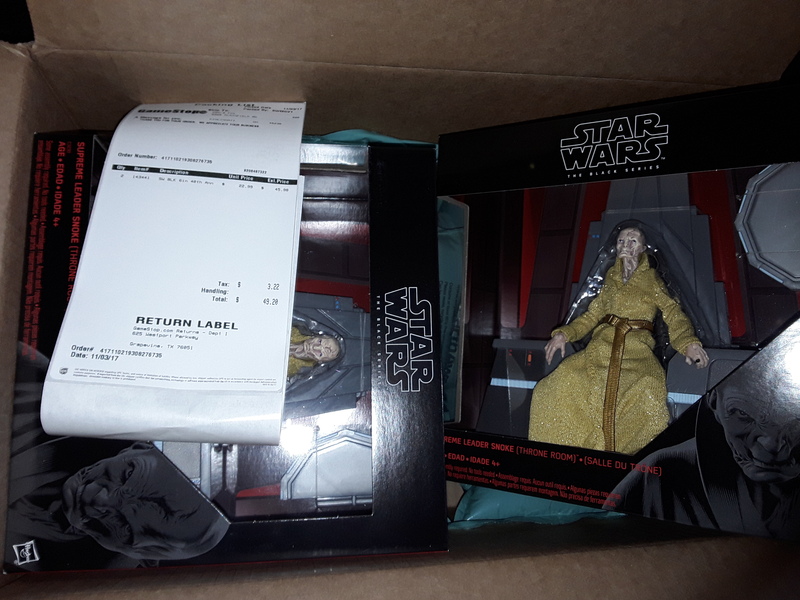 He opened the large box to find two Supreme Leader Snoke (throne) instead of the Artoo’s. The receipt even says Artoo 40th Anniversary. This seems to happen more than it should. Have any of you had a similar mistake happen? Let us know in the comments below! 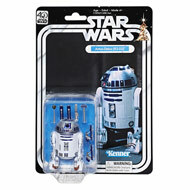 Gamestop.com Has 40th Anniversary Artoo In Stock Now! You can order the Black Series 40th Anniversary R2-D2 from Gamestop.com for $22.99, you can also get free shipping on orders over $35. Thanks to JTA Reader Kevin for the heads up! UPDATE: GameStop Cancelling TBS6 Inferno Squad Figures? It looks like GameStop has begun to cancel orders for the Inferno Squad TIE Fighter Pilot. JTA reader Ray M. has received an email from GameStop explaining that his order has been cancelled. The figure also now shows as “Unavailable” on the site. UPDATE: Our readers are letting us know that their orders are being processed for this figure, so it appears this cancellation example must have something to do with an outdated credit card on file for Ray. Thanks to all who wrote in and in the comments! You can now order The Black Series [Phase III] 6″ Jaina Solo at Gamestop.com with a release date of December 10th. I’m not sure if that is the actual date or not because I was told November in store. We’ll keep you updated! ← Gamestop.com Pro Day Deals! Gamestop is offering Pre-Orders on The Black Series 6″ Jaina Solo IN STORE. Not sure what the date for release is because it shows as 12/31/1979 in my Gamestop app. While I was there, I was informed that on October 11th they will be releasing a new Elite Pro Membership that will be geared towards collectibles. You will get discounts for collectibles throughout the year. I know the Pro membership is worth the $15 because of the multiple Pro Day’s they have throughout the year. Found some GREAT savings today with the BOGO 50% off on ALL collectibles. Also, they can order you items in store if they don’t have it in stock. If you’re a Pro member at Gamestop.com, then today is your day! You can get AMAZING deals of Buy one get one 50% off on ALL collectibles! That includes ALL Star Wars black series (even the new items such as the speeders or center pieces). Unfortunately, it does NOT apply to pre-orders. Remember, you MUST be a pro member to get the 50% off. ← Guardians Of Evil 4-Pack $10 Cheaper At BarnesAndNoble.com! Pre-order TBS6 [P3] Wave 13 At GameStop RIGHT NOW! You can pre-order all of wave 13 of The Black Series [Phase III] 6″ line at GameStop right now! Stop By Gamestop.com For Some Great Deals! There’s not a lot of Force Friday product available, but while looking I couldn’t help but notice some other great deals! $14.99 Legacy Pack and $9.20 40th Anniversary Leia, to name a few. The Battlefront II Inferno Squadron figure is also in stock. Check it out and see if you need anything! Good GameStop Clearance - Check It Out! How about one more set of deals right before Force Friday II? GameStop has some great The Black Series 6″ stuff on sale. 40th Anniversary Princess Leia Organa for under $8 and the Legacy Pack for $15.99. But you should probably click through and see what other deals there are as well! Special thanks to JTA reader Colton M. for the alert on the deals. Retailer Robot Kingdom has updated their site product page for the Inferno Squadron TIE Pilot which shows a new January 1, 2018 release date (instead of the November 2017 date shown on GamesStop’s product page. (Anything can change of course.) It’s more than likely that this just means “sometime in first quarter 2018” and there is something much bigger coming then anyhow. If you’re a Pro-Member at Gamestop, today you can get all collectibles Buy One Get One 50% Off. This includes the pre-order for the Inferno Squadron Pilot. For some reason, the discount doesn’t show up in the cart or purchase, but customer service assures me it will come off at the time you’re charged. Not a bad deal if you ask me. Check out all the Star Wars collectibles on sale.